While browsing old folklore journals for an annotated bibliography assignment for my Folklore Theory class, I came across this brief article, published in the December 1897 volume of Folklore, a British academic journal. The article, by A.B. 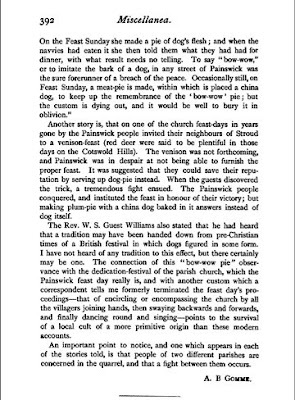 Gomme, remarks on the tradition of baking small porcelain dog figurines into plum pies on Painswick Feast-Day, celebrated the Sunday after September 19th (as good a day for a feast as any, I suppose!). 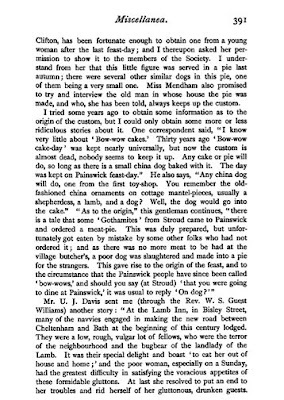 The story goes that this Painswick, England tradition apparently came about when some travelers from Stroud came a-visiting and ordered a meat pie. There was no more meat, so the village butcher looked around for a substitute-- and his eyes finally settled on his poor dog. 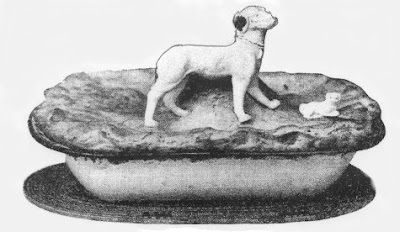 If anyone ever finds a porcelain Painswick dog, do send it my way, and we'll put it in a bow-wow pie next time sunday-after-september-the-nineteenth rolls around!